Sausages come in two main types: fresh and cured. Cured sausages may be either cooked or dried. Most cured sausages are smoked, but this is not mandatory. The curing process itself changes the meat and imparts its own flavors. An example is the difference in taste between a pork roast and a ham. All smoked sausages are cured. The reason is the threat of botulism. The bacterium responsible, Colostrum botulinum, is ubiquitous in the environment, grows in the anaerobic conditions created in the interior of the sausage, and thrives in the 4 °C (39 °F) to 60 °C (140 °F) temperature range common in the smoke house and subsequent ambient storage. Thus, for safety reasons, sausages are cured before smoking. Equipment depends on scale, a small home grinder and some basic measuring tools may be all that is required. In a larger scale commercial operation, more high volume equipment will be required. 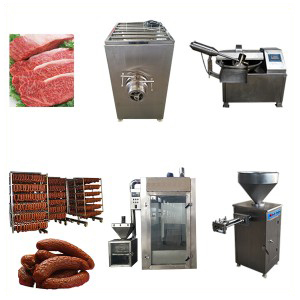 Regarded as the three most important pieces of equipment, regardless of the amount of sausage being made are an accurate thermometer, a calibrated scale, and a meat grinder. Smoked or smoke/cooked sausages require a smoker (small batches) or a commercial smokehouse. Emulsion-type cooked sausages, such as frankfurters or bologna, use a bowl chopper to make finely ground meat batter that is put into casings and cooked or smoked.